Black Friday and Cyber Monday are almost upon us, and the countdown to the holidays has officially begun. Chances are, someone on your list is a music fan, but what do you get the music buff who has every vinyl record and special-edition box set out there? Read on for Audio Ink’s 2018 holiday gift guide, which features a collection of books out this year that might be the perfect find for the music fan in your life. Mark Tremonti of Alter Bridge has kept busy with his solo band, Tremonti, as the group not only released a new album this year but also a hardcover novel. Both are called “A Dying Machine,” and while it’s likely that the Tremonti fan in your life already has the album, the book is a unique pick. The hardcover novel centers around Brennan Gibbons, who enters and wins the 22nd Century Lottery to buy a first-generation Vessel– an artificial human, part flesh, part machine, created to be the perfect partner. Find the book via Tremonti’s official website here. Guitarist K.K. Downing parted ways with Judas Priest in 2011, but fans haven’t forgotten his longtime contribution to the metal band. 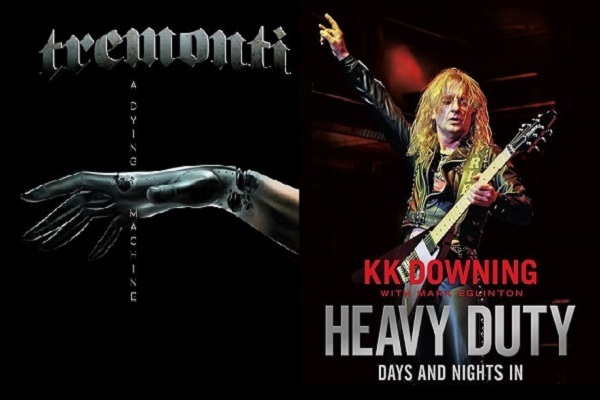 In Downing and Mark Eglinton’s “Heavy Duty: Days and Nights in Judas Priest,” Judas Priest enthusiasts get an in-depth look at Downing’s early years, what drew him to metal music, the early days of Judas Priest and what his life has been like after leaving the band. It’s a must-have for the Judas Priest fan on your list. Find “Heavy Duty” on Amazon here. Ad-Rock and Mike D of Beastie Boys recently released their nearly 600-page “Beastie Boys Book,” and it tells the full backstory of the band. In addition to dishing on how the Beasties got together and made a name for themselves, “Beastie Boys Book” also features some fun anecdotes, such as the time Mike recalls meeting Guns N’ Roses in the studio and Ad-Rock remembers being asked to record a rejected MC Hammer song. This collection is certainly full of some lesser-known Beastie Boys nuggets. Find the book on Amazon here. Lacuna Coil’s first-ever book, “Nothing Stands in Our Way,” is the female-fronted Italian metal band’s extensive look back on their 20-year career. The book, which is available in classic and signature editions, features rare photographs, memorabilia and personal artifacts from the collections of founding members Cristina Scabbia, Andrea Ferro, and Marco Coti Zelati. The classic edition of the book is a 224 page, 200+ image-filled hardback with foil detailing, while the signature edition is the same hardback in a deluxe clamshell box, signed by the band, with four exclusive, original art prints. Find both editions of the Lacuna Coil book, penned by Mark Eglinton, here. Roger Daltrey’s new autobiography, “Thanks a Lot Mr. Kibblewhite: My Story,” sees Daltrey telling his full life story, from his birth during World War II to his years as an unruly student to founding what would become one of world’s most celebrated rock ‘n’ roll bands. The book also includes many stories from his time as the Who’s frontman and writing and recording the band’s biggest albums. “Thanks a Lot Mr. Kibblewhite: My Story” is available on Amazon here.